Welcome to Day #7 of Chocolate and Salt Theme Week, and Day #1 of Chocolate, Salt and Almond Theme Week. 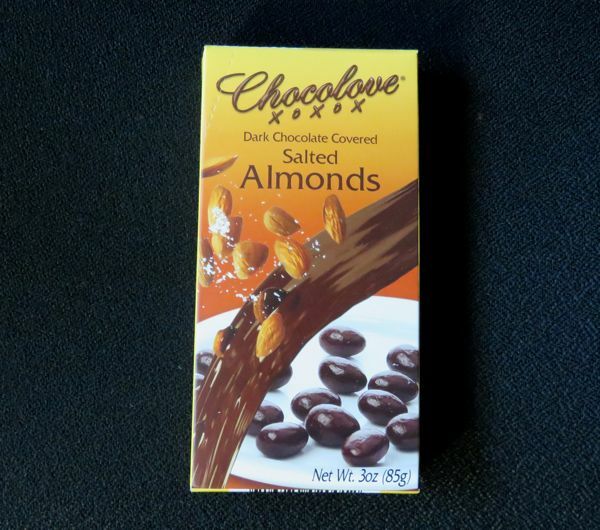 Today I enjoyed a few handfuls of Dark Chocolate Covered Salted Almonds from Chocolove (Boulder, CO). The thick, rich 55% cocoa Belgian chocolate coating the almonds was made with certified "For Life*" cocoa. This dark chocolate was a bit more flavorful than many other chocolate confection coating materials. The combination was tasty. 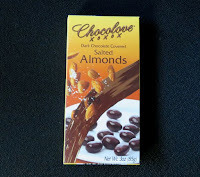 The roasted/toasted almonds at the center of each piece provided a pleasing nutty crunch; however, the subtle nut flavor was somewhat overshadowed by the more robust dark chocolate and even the salt, that was fairly evenly incorporated throughout these almonds. Still, it's hard to go wrong with this combination. *"For Life" cocoa means "it was farmed in a socially responsible and ethical manner" according to the packaging.